A warmer atmosphere holds more moisture. Simple physics. In the American midwest, where I live, everyone knows we are seeing more intense rain events. Here’s how it plays out in much dryer and more sensitive areas. As I’ve mentioned before, one positive effect of global warming will be the large increase in really cool viral videos. At least 10 people have been killed by catastrophic floods in northern regions of Chile after thunderstorms brought the equivalent of 7 years of rain in just 12 hours on March 26. Search and rescue operations are still in progress and authorities fear the number of casualties will rise. Flooding has affected the regions of Atacama, Antofagasta and Coquimbo, all located in the Atacama Desert, one of the driest regions of the world. Heavy rainfall and consequent river overflow, flash floods and landslides knocked out power and communication lines, destroyed infrastructure and made roadways impassable. A state of emergency is in effect since March 26 for the Atacama Region and the Antofagasta municipality. The Health Ministry has declared a Sanitary Alert in Copiapó, Tierra Amarilla, Diego de Almagro and Alto del Carmen. Between Thursday and Friday about 24 mm fell on the city of Antofagasta, an area that typically receives about 1.7 mm of rain in a year, according to the Chilean meteorological service. Southern Peru was also affected by recent heavy rain. Intense rainfall in Chosica caused deadly mudslide on March 23 which left 8 fatalities, 6 missing and 25 people injured. In addition, 153 houses have collapsed as a result of this event. Scientists are also learning that the ocean has gained more heat, and at greater depth, than they had realized. That means the entire climate is even more out-of-whack than is evident today. The long-term heat gain in the top 700 meters (.43 miles) of the world’s oceans has likely been underestimated by as much as half, according to Lawrence Livermore National Laboratories research scientist Paul Durack. Earlier measurements had lowballed heat accumulation due to historically sparse observations for large parts of the ocean. The figures were especially low for the Southern Hemisphere, which contains about 60 percent of the planet’s oceans but was very poorly sampled — until Argo, an array of around 3,500 floating sensors, was deployed worldwide in 2005. An updated analysis by Durack and colleagues found that from 1970 to 2004, the upper 700 meters of oceans in the Southern Hemisphere had gained from 48 to 166 percent more heat than earlier observations had estimated. Globally, the findings suggest, upper oceans hold 24 to 58 percent more heat than most current climate models assumed. Excess energy is also penetrating deeper into the ocean and farther south, Roemmich and colleagues found, analyzing Argo data measuring heat down to 2,000 meters (1.24 miles). The network provides the first comprehensive measurements of the deeper ocean; most prior readings stopped at 700 meters. The researchers found that from two-thirds to 98 percent of the substantial ocean heat gain between 2006 and 2013 took place well south of the equator, where giant gyres drew it down. And half of the gain occurred from 500 to 2,000 meters deep. How Many Kids Will it Take? How many kids must we feed to the fossil fuel monster before we inevitably transition to clean, renewable power? The biggest subsidies we give to fossil fuels are our childrens lungs, hearts, and brains. Steve Milloy, Tobacco turned climate shill, tells us our children and old people need to dig down and sacrifice more…for the coal barons. In a falsehood-filled Washington Times op-ed, Steve Milloy attacks the EPA and EDF for supporting tough new clean air standards for coal-fired power plants. Asking EPA to “show us the bodies,” Milloy questions public health estimates that these standards will prevent up to 17,000 premature deaths every year. Some might find it odd to question decades of research by innumerable scientists and public health professionals. But, for Steve Milloy, notorious climate denier and tobacco apologist, it’s something of a personal trademark. Had he done any actual research for his hit piece, he may have come across a May 10, 2011, letter written by the American Academy of Pediatrics, the American Lung Association, the American Public Health Association, the American Thoracic Society, the Asthma and Allergy Foundation of America, and the Physicians for Social Responsibility to Congressman Joe Barton (R-TX). Why do Climate Deniers Hate Sea Lion Pups? Senator Cruz, put down that club! In recent weeks, emaciated young sea lions have been washing up on California beaches (though a few healthy ones have also shown up, including one who got to hang ten with a local surfer). Roughly 1,800 stranded pups have been found on California beaches through the first two-and-a-half months of 2015. That’s well above the 100 or so that usually turn up through the end of March and “at least as high as anything in the historical record,” according to Nate Mantua, a scientist at the Southwest Fisheries Science Center in La Jolla, Calif. 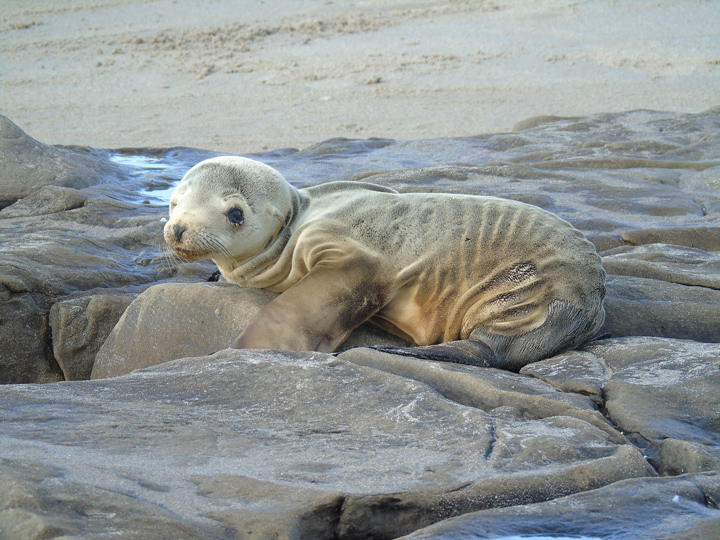 In 2013 and 2014, large numbers of disheveled sea lion pups were also stranded on California’s beaches, though not at the same levels as this year. In coming to know hundreds of oceanographers, atmospheric scientists, glaciologists and other climate specialists over the last few years, I am continually struck by the humor, warmth, creativity, smarts, and humanity of the people working in these fields. Most folks don’t get to meet a lot of full time scientists in their day-to-day lives, and a new video series seeks to remedy that. “More than Scientists” is a new social media project that seeks to bring a human face to the people involved in this very special work, and they’re producing a series of really well done videos that I think should get a wide audience. Science – The disciplines are as diverse as life on earth. A problem of global scale requires everyone: from physicists to physicians, marine biologists to atmospheric chemists, ice to fire ecologists, from the soil to the upper atmosphere, it takes us all. We are scientists. We span the fields of scientific inquiry, span the political spectrum, and the nation. We are dedicated to the pursuit of knowledge, understanding. We represent the more than 97% of scientists who believe climate change is happening, that it is due to our actions and that it is within our power to keep it from being devastating. We are more than scientists. It will take more than science. It will take us all, working together, for a better future. The effort, which is privately funded and led by climate activist Eric Michelman, seeks to forge a better connection between scientists and the general public who hear the results of their work. More from my wide ranging conversation with Mike Mann, on the recent indications of a slowdown in the North Atlantic Meridional Overturning Current. Here, we discuss the very important role that the “ocean conveyor belt” provides in supplying oxygen and nutrients to deep levels of the ocean, worldwide. A slowdown, or shutdown, in this circulation will have global impacts, potentially for millennia. Villagers of the high desert of Ladakh in India’s Jammu and Kashmir states used to harvest bountiful crops of barley, wheat, fruits, and vegetables in summer. But for years the streams have run dry in spring, just when farmers needed water to sow seeds. They had water when it wasn’t needed during the rest of the year, such as in winter, when Ladakhis let water gush from taps to prevent pipes from freezing and bursting. Villagers blame climate change for causing glaciers to shrink. To resolve the water-shortage problem, Sonam Wangchuk, a mechanical engineer, and his team of volunteers are building a gigantic vertical block of ice in Phyang, nine miles from Leh, the capital of Ladakh. When spring comes and the artificial glacier melts, farmers will have flowing water. The ingenious method stores water without the need for concrete water storage tanks or dams. While it won’t stop glaciers from shrinking, it could help people adapt to a warming world. Last winter, Wangchuk built a 6-meter prototype on a fully exposed riverbank to test his idea. It stored 150,000 liters of water at 3,170 meters, the lowest altitude in Leh valley. This, he said, proved ice pyramids can be built anywhere in the region. 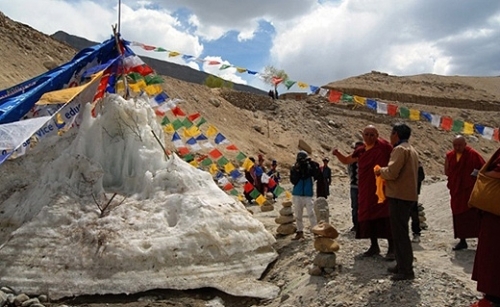 The frozen cone resembles Buddhist mud stupas, and Wangchuk was quick to come up with a name for them: ice stupa. When the prototype lasted until mid-May, he was encouraged to attempt a 30-meter pyramid of ice this winter. But the cost of piping water from the Phyang stream, 1.5 miles away, was an exorbitant $100,000. Unperturbed, he raised the money on the crowd-funding platform Indiegogo and work began on January 21.